As you drive through Rocky Mountain National Park you see a lot of mountainsides (started to type hillsides and corrected myself!) that look like this. I admit to increasing the color saturation on this photo slightly to bring out what I want you to see, but the large swaths of red-brown trees are obvious regardless. 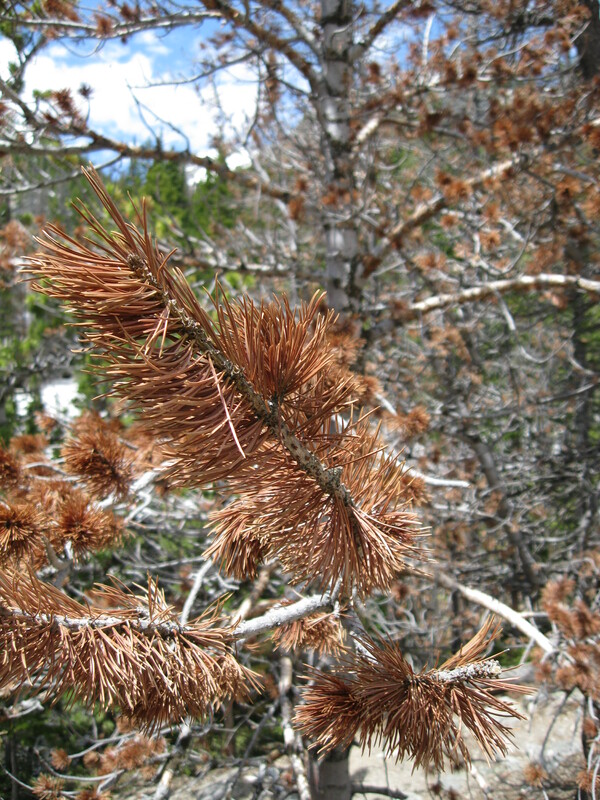 Something is attacking and killing large numbers of lodgepole pines. The culprit is the mountain pine beetle, Dendroctonus ponderosae. The dead and dying trees are everywhere you turn. 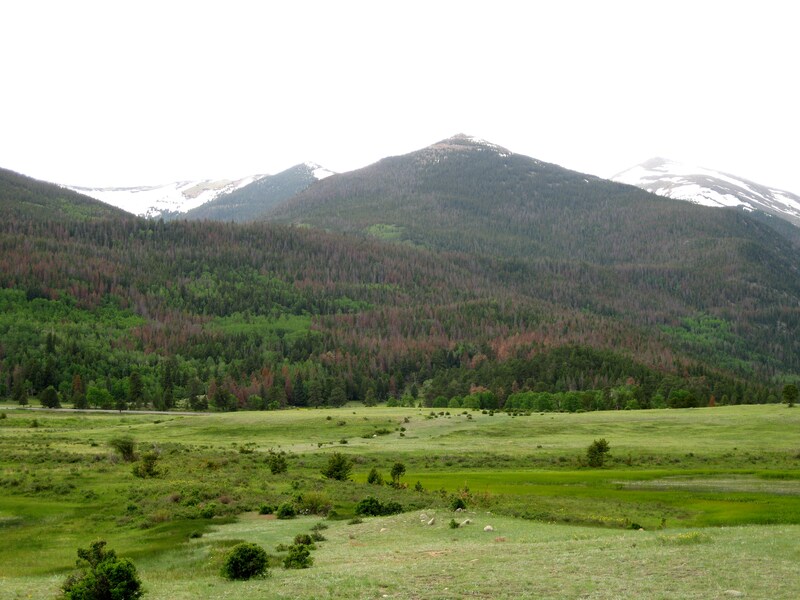 Pine beetles are native to North America, but droughts and warm winters (likely due to global warming) have led to an unprecedented explosion in their numbers. They infest a pine tree by laying their eggs under its bark, which introduces a fungus into the tree that blocks water and nutrient transport as well as the flow of the sticky pitch, with which the tree might otherwise defend itself. (This is actually similar to how the invasive ambrosia beetle, which I’ve written about previously, attacks bay trees.) Apparently this leads to characteristic blobs of pitch forming on the surface of the bark, and if I’d known that I’m sure I could have found examples to photograph but I didn’t know what I was looking for while I was there. 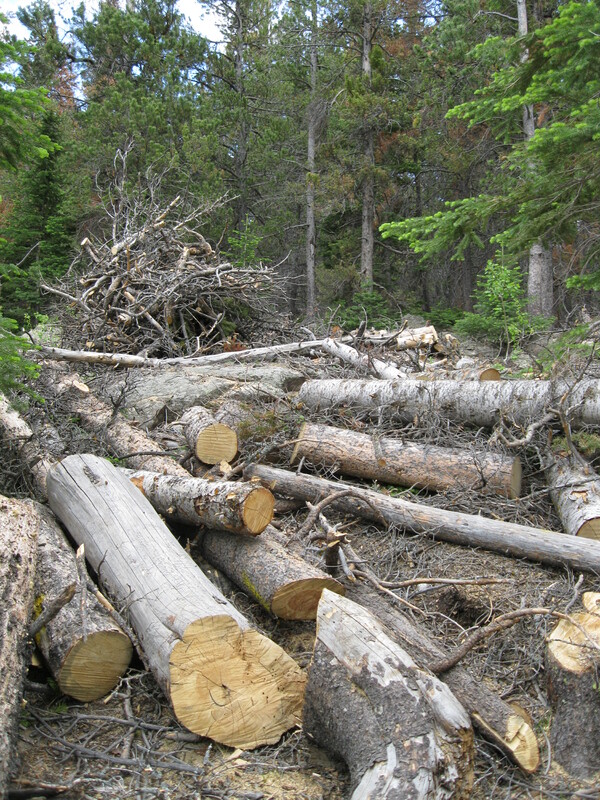 One of the more effective management techniques is to remove affected trees before the beetles can spread, and we saw some places in the national park where tree removal had been taking place. Unless something changes, this epidemic could continue indefinitely. Very sad. I backpacked in RMNP on the west side of the Divide in 2006. I noticed some areas with beetle infestations, but it didn’t strike me as out of control. I was totally unprepared for what I saw two years later . . . entire watersheds west of the Divide had gone reddish-brown. In 2009, I saw harbingers of the same damage in Glacier. And last summer, on our long road trip to-and-from Alaska, I was stunned by the full extent of the pine beetle problem. It’s the same miserable story from Kluane and the headwaters of the Tatshenshini in Yukon Territory to the San Juans in Southern Colorado. Winters just aren’t cold enough anymore to provide the sorts of hard freezes that used to keep beetle populations in check. Last fall I traveled to South Dakota’s Black Hills….which are becoming the Brown Hills due to mountain pine beetle deaths. Recently I saw an article saying that the costs of fighting the beetle meant that the program was killed. Annie Proulx’s memoir Bird Cloud touches on the effects of the mountain pine beetle in Wyoming. 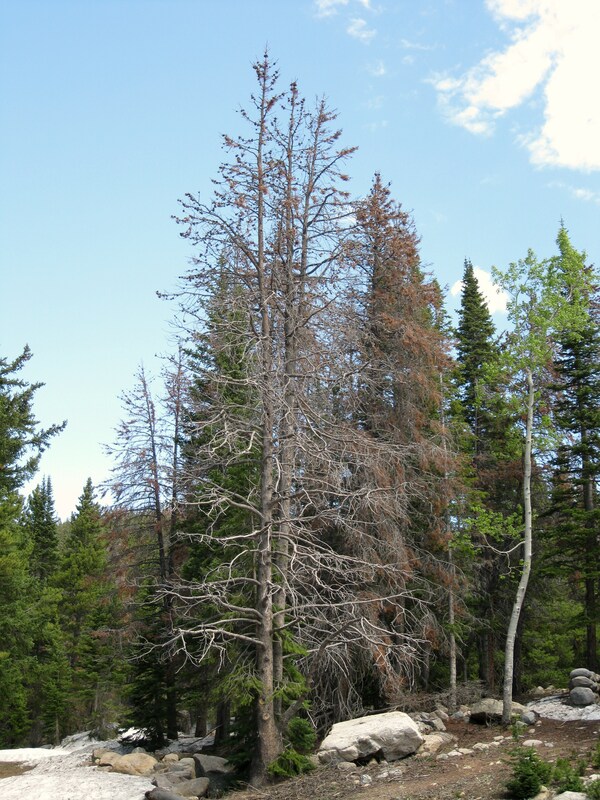 Years ago I visited Flat Tops Wilderness Area in northwestern Colorado and saw similar damage to the Engelmann spruce from spruce budworm. That outbreak happened in the 40s. I wasn’t aware of this situation though.